How will they ever know about us? – Aaniish owa zhi kendamagooying? – Vont-ils comprendre qui nous sommes? How will they recognize whose land they’re on? – Aaniish owa zhi zidwaamdamowaad wenesh da kiing yaaying? – Comment vont-ils respecter nos terres? How will they know about us as we live today? – Aaniish owa zhi kendamagooying ezhi bmaadziying nongo? – Comment vont-ils comprendre qui nous sommes aujourd’hui? These questions have also been some of the guiding questions that seem to steer and permeate my research in Indigenous Heritage Studies for the past few years – questions that are associated with issues of storytelling, identification, land acknowledgement, reconciliation, collaboration with non-Indigenous people and other subjects that have also been addressed at this year’s Canadian History and Environment Summer School on “Gender and Indigenous Landscapes,” hosted by York University in Toronto. We relate to cultural heritage the same way we relate to land – through stories. Indigenous heritage sites can thus be seen as tribal, local, and global storytellers, informing and educating local, regional and even international communities, not only about the past, but also about the present and future of peoples and societies associated with the respective sites. Exploring the involvement of Indigenous communities in the management of and the storytelling at different heritage sites throughout my research, the visits to the Crawford Lake Conservation Area, the Woodland Cultural Centre, and the Mohawk Institute Residential School during CHESS told different stories of Indigenous involvement and (self-) representation. The Crawford Lake Conservation Area near the community of Campbellville in Milton, Ontario, is owned and operated by Conservation Halton, a community-based management agency that forms a partnership with the Province of Ontario, the Ministry of Natural Resources, and regional municipalities. 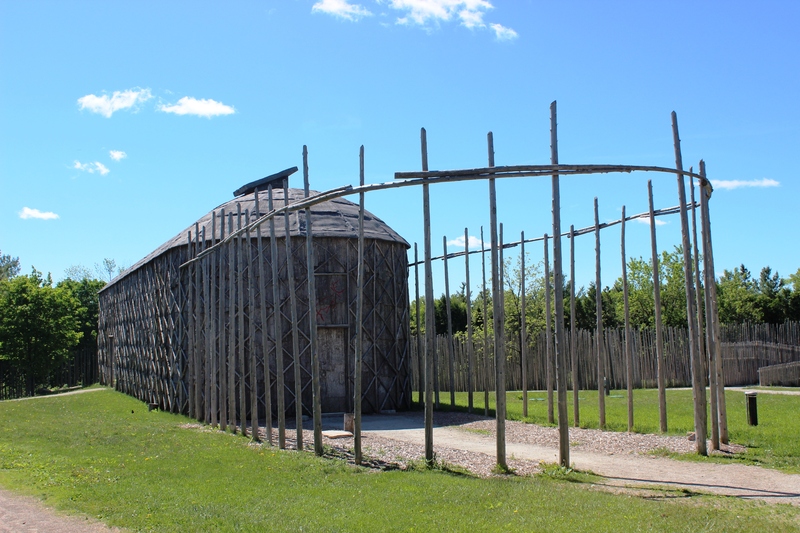 Besides Crawford Lake (a meromictic lake at the heart of the park), a reconstructed fifteenth-century Iroquoian village is the main attraction of the area. This heritage site invites visitors to “explore local history” and “learn about what daily life was like over 600 years ago.” Archaeological excavations (beginning in 1972) uncovered remains of eleven longhouses and countless Iroquoian artefacts on the site. Wandering around the village, I was following an interpretive program, watching a fire starting demonstration in one of the three reconstructed longhouses (filling it with smoke) and school children playing lacrosse on the village green, examining pottery and corn made of plastic and a (rather dated) wall painting of daily life in a longhouse. Short texts describe the use of different tools or the life inside a longhouse. The interpretations have been updated by the owners as “new information from archaeological investigators, consultation with First Nations scholars and elders and historical documentation is revealed,” as a plaque explains. While the site is undeniably a stimulating introduction to Indigenous culture and lifestyle to the public (and the more than 32,000 students aged 6 to 16 who visit each year), the exhibition presents Iroquois history and culture from an archaeological perspective and (as countless other reconstructed villages) generally remains within the past. Our groups’ lunch of “Three Sisters Soup” in the stunning modern space of the Deer Clan House, prepared by an Indigenous caterer, and stumbling upon the following invitation brought the “Indian” back into the present: “After you leave the village we would encourage you to continue to learn about the rich and diverse cultures of the First Peoples who live across Canada today,” the inclined visitor can read on a sign. Telling a complex story of history, science, and environment, however, the Crawford Lake village might satisfy tourists’ expectations who are looking for “people of the past”, but leave them without a connection to contemporary Indigenous cultures and challenges. 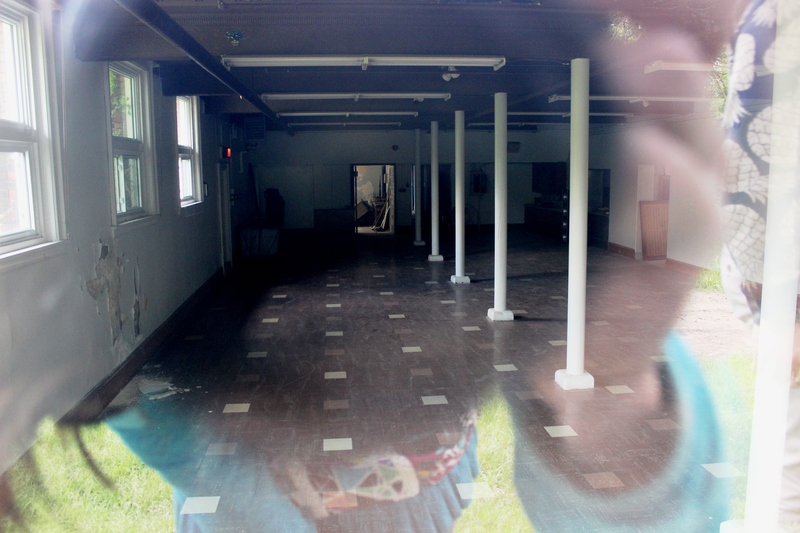 As I was gazing into the empty dining hall, many perspectives on storytelling of the past were coming together. The room was dark, with a linoleum floor; the plaster on the walls was crumbling. A few minutes earlier I had seen this room on old photographs in the “Mohawk Institute Virtual Tour” (54:29 min), a film screening at the Woodland Cultural Centre. Children were sitting at long tables, girls on one side, boys on the other side of the room, not being able to see the green grass or blooming trees outside as the windows are too high. The stories that this room tells are harsh – stories about children that were forced to eat stale, unhealthy food and if they did not comply, the bowl would be kept for them and they would be served the same gruel at their next meal, and the next, and the next. As I see my reflections on the photograph I took, I feel like an observer who takes a peek into the past, sensing the stories, reading them within the setting of my own cultural and historical background as a German academic, framing and supporting them with stories of other cultures, and other times. Gradually, Indigenous interests and values have been taken into consideration by museum curators who “progressively have come to consider Indigenous communities as authorities of their own cultural heritage and have started to cooperate with them in the context of the management of their ethnographic collections,” as Lilla Vonk states. This development reveals changing power relations between museums and “source communities”, in which “both parties are held to be equal and which involves the sharing of skills, knowledge and power to produce something of value to both parties”. Sharing power, though, is neither simple nor conclusive, but a complex and unpredictable first step in building new relations between heritage sites and Indigenous communities. However, the storyteller always shapes the story. It is time, therefore, that Indigenous people tell their own stories, interpreting their heritage sites and artefacts. The sites that we visited at CHESS fall within traditional First Nations territory and have engaged in living and dynamic relationships with non-Indigenous communities and museums to help shape the representation of First Nations and the management of their cultural material and history. The discussions on our journey did not aim to provide definitive answers, but highlighted the many competing issues and interests that influence heritage sites and communities and their relationships. Yet only if the Indigenous voice speaks and is heard, the questions asked in the beginning of this text can be answered and turned into statements by Indigenous people: They will know about us. They will recognize whose land they’re on. They will know about us as we live today. Outcome of the War of 1812: First Nations Betrayed. Exhibit Guide. Mississaugas of the New Credit First Nation, City of Toronto Museum Service, 2017. John Allemang, “New Credit First Nation gets a ‘thank you’ 200 years later”, The Globe and Mail, 21 June 2013, https://www.theglobeandmail.com/news/national/new-credit-first-nation-gets-a-thank-you-200-years-later/article12758245/, retrieved 19 July 2017. Geneviève Susemihl, “Storytelling from Tribal to Global: Cultural World Heritage Sites as Universal Narrators”, in: Kerstin Knopf (Ed. ), North America in the 21st Century: Tribal, Local, and Global. Trier: Wissenschaftlicher Verlag Trier, 2011, 271-286. Halton Conservation, Crawford Lake, http://www.conservationhalton.ca/park-details?park=crawford-lake, retrieved 20 July 2017. Peers, Laura and Alison K. Brown (Eds. ), 2003. Museums and Source Communities: A Routledge Reader. London: Routledge, 1. The Woodland Cultural Centre, “About us”, http://www.woodland-centre.on.ca/about-us, retrieved 19 July 2017. The Woodland Cultural Centre, “Museum”, http://www.woodland-centre.on.ca/museum, retrieved 07 September 2017. Yasmin Gunaratnam, “Cultural Vulnerability: A Narrative Approach to Intercultural Care”, Qualitative Social Work, Vol. 12, Issue 2, 2013, 104-118. CBC Radio, “Why a Mohawk community chose to preserve a residential school building”, 15 June 2017, http://www.cbc.ca/radio/tapestry/preserve-or-destroy-1.4162162/why-a-mohawk-community-chose-to-preserve-a-residential-school-building-1.4162177, retrieved 07 September 2017. Indigenous and Northern Affairs Canada, “Indian Residential Schools”, http://www.aadnc-aandc.gc.ca/eng/1100100015576/1100100015577; Truth and Reconciliation Commission of Canada, “Residential Schools of Canada”, http://www.myrobust.com/websites/trcinstitution/File/pdfs/2039_T&R_map_nov2011_final.pdf, retrieved 08 September 2017. Bryony Onciul, Museum, Heritage and Indigenous Voice: Decolonising Engagement. London: Routledge, 2014, 3-4. Tony Bennett, “Exhibition, Difference, and the Logic of Culture”, In: Karp, Iva, Corinne A. Kratz, Lynn Szwaja and Tomas Ybarra-Fraustro (Eds.). Museum Frictions: Public Cultures/Global Transformations. Durham: Duke University Press, 2006, 56. Bryony Onciul, Museum, Heritage and Indigenous Voice: Decolonising Engagement. London: Routledge, 2014, 4. Lilla Vonk, “Indigenous Peoples and Ethnographic Museums: A Changing Relationship”; Östersund: The Nordic Centre of Heritage Learning and Creativity, 2013, 3, http://nckultur.org/wp-content/uploads/2013/05/Report-Indigenous-communities-and-museums-L-Vonk.pdf, retrieved 09 September 2917. Peers, Laura and Alison K. Brown (Eds. ), 2003. Museums and Source Communities: A Routledge Reader. London: Routledge, 2.